If you've ever been exploring in an ancient tomb, you probably know what kinds of scary things you can run into in the dark. Like old booby traps, or giant spiders, or even realizing you forgot to pack a snack and you're starting to get hungry (our personal worst nightmare!). That's why it helps to find an ancient mummy who knows their way around to show you where all the cool stuff is hidden, especially if it's your little one in this frightening Mummy Costume! Having a mummy for a guide may not seem like the greatest idea, since tombs are like their homes, and you probably wouldn't be too helpful if someone was snooping around your home, either. But some mummies get bored after spending thousands of years in a dark, dreary dungeon, so they might actually appreciate the company. Showing visitors around also gives them a chance to stretch their limbs a bit, which can get a little stiff from laying in a sarcophagus for so long. And who knows, maybe there are some awesomely spooky things in the tomb that they would love to show off! Your little mummy guide will be ready to show you the sights in this one piece gauze jumpsuit, which is made to look like it's made of wrapped bandages, but this won't come unraveled. 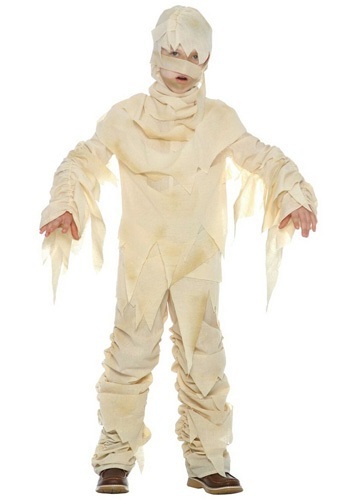 Once they put on the matching gauze hood and stretch out their arms in their best mummy pose, your little one will be all ready to lead you through a spooky tomb, or to take you trick-or-treating! When you're exploring with a helpful little mummy, they'll show you that the only scary thing out there is running out of candy! Order 2t-4 and it fits my 8 year old still big. There are hardly any wraps around it and looks nothing like the picture. The jumpsuit was fine. I ordered the 14-16 size. The hood, however, looked like it was sized for a toddler. The fabric and coverage looks nothing like the hood in the photo. Very skimpy. Very cute, not as complicated for my son to put on by himself as I feared it would be. It was just a ok. I bought this for my 5 year old and it was way too big. He may be able to use it in a couple years but its really not that great. We received the costume promptly after ordering it but it was NOT AT ALL like the picture. You could see mostly the cheap white material underneath that the strips are attached to because there were only about 8 actual strips on the costume. I had to go to Hobby Lobby and purchase fabric for $6 and fabric spray glue for another $8. My husband and I spent an entire evening cutting strips and gluing them on. I am 6 months pregnant so my husband would have to go to the basement to spray each strip so I wouldn't breathe in the chemicals. The fix worked for this year but it rained on Halloween when we were trick-or-treating so the costume is now ruined. Very disappointed. This picture is pretty much what it looked like after I added over a yard of fabric to it. Very misleading.